Ever since his family left Virginia for Colorado, Tommy has been at loose ends and out of sorts. He left behind him in Virginia not only his Aunt Maggie, but the pictures she taught him to see and all of his dreams. In Colorado, everything seems dreary, or hostile – the barren plains, the dusty town, the gang of teenagers who roam the neighborhood, each one with a strange new name. Even his dreams have turned against him. Then one day, while exploring a canyon with a new friend, he is chased by the gang deep into a cave – and then down, down, down. He and his friend will end up in the Firmament – which is not quite where he wanted to go, but it may be better than where he’s been. Point Horizon is a book for middle-graders, written by David Zelenka. Although a novel, its primary purpose is to give a vision of the world that blends an awareness of beauty, a knowledge of science, and spiritual vision. 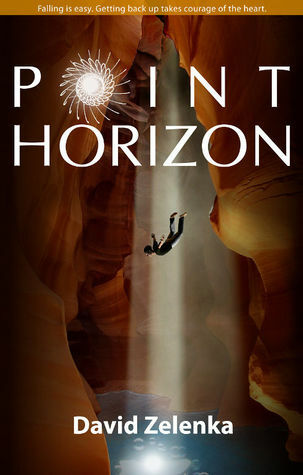 Point Horizon is a scientific book as much as it is an adventure. Zelenka, a teacher and a former Park Ranger, writes knowledgeably about the landscape and animals of Colorado and about the science of the Firmament’s special environment. He also writes in a clear, vivid style that evokes the natural beauty of the places he brings his readers to. The spiritual vision of the novel is clearly and broadly put forth; the doctrines of Christianity are not delineated, but the spirit of it shines through. Physically, the book looks good. The cover is eye-catching, the font easy to read, and the illustrations at the chapters’ openings are simple but enjoyable. The book is 40,000 words and totals up to just under two hundred pages – roughly half of an adult novel. Point Horizon is, as I said, written for middle-graders, and considering the length, content, and writing level, it is an excellent bridge for young readers transitioning from children’s to grown-up books. The adventure side of the novel was not, I thought, quite strong enough. It needed something – more excitement, some additional danger or opposition to the characters. Despite this lack, Point Horizon is a well-written, imaginative book that shows knowledge and serious thought. Recommended for children about ten to twelve, especially children interested in science or other worlds.